Cognitive Services - Anomaly Detection APIsAdd anomaly detection capabilities to your apps to identify problems as soon as they occur. Microsoft Azure Stack Microsoft Azure Stack은 Azure의 확장으로, 온-프레미스 환경에 클라우드 컴퓨팅의 민첩성과 혁신을 제공하며 어디서나 하이브리드 응용 프로그램을 빌드하고 배포할 수 있는 하이브리드 전용 클라우드를 사용할 수 있도록 합니다. Microsoft는 사용자의 환경에서 어디서나 Azure 서비스를 제공하기 위해 최고의 에지와 서비스를 함께 제공합니다. Azure Stack HCI 솔루션HCI(하이퍼컨버지드 인프라) 솔루션을 사용하면 온-프레미스로 가상 머신을 실행하면서 손쉽게 Azure에 연결할 수 있습니다. Notification Hubs모든 백엔드에서 모든 종류의 플랫폼으로 푸시 알림을 전송할 수 있습니다. 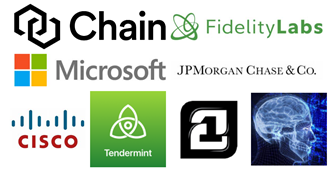 Microsoft has just become a member of IC3, The Initiative for CryptoCurrencies & Contracts. We are excited to collaborate with this team of world class experts in cryptography, game theory, distributed systems, programming languages, and system security. Their work is aligned to five areas, which they call Grand Challenges, that form the basis of blockchain enterprise readiness: Scaling & Performance, Correctness by Design, Confidentiality, Authenticated Data Feeds, and Safety & Compliance. When I first set foot in the IC3 office, it was sitting in a temporary office space near Chelsea Market in New York. Cavernous, unorganized, and teeming with students, it was hard to find the focus of the space. I was there for a meetup on Town Crier, being presented by Ari Juels. Having been invited by Jim Ballingall, Executive Director of IC3, I was there to come in and meet some folks, see what they are about, and do what you generally do at meetups. This was after having tried unsuccessfully to recruit Andrew Miller to join our crypto team over in Microsoft Research earlier in the year. Andrew and I had a great Skype call while I was attending Microsoft’s annual //BUILD event in San Francisco, where we would first launch the ConsenSys teams’ work to integrate the Ethereum Smart Contract language, Solidity, with Visual Studio. Note, there are now 3 Solidity extensions to Visual Studio and Visual Studio Code available. Ultimately Andrew decided to stay in academia and landed at the University of Illinois, Champaign-Urbana, coincidentally where I was born, but that’s another story. Watching Ari’s Town Crier presentation, it immediately struck me as approaching a problem we w ere also trying to solve at Microsoft. 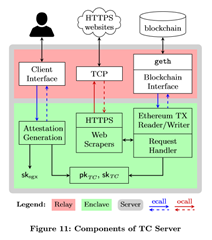 Our approaches were different, but ultimately this work aligned with how we thought about some common problems in the blockchain space, trusted data feeds (often called oracles in blockchain lingo) and confidential queries via smart contracts. It also leveraged a new capability called secure enclaves to achieve some of this. Interestingly, we had similar work going on with two projects we’ve announced that handle these two concerns in different ways. The first project is Enterprise Smart Contracts, originally announced as Cryptlets in June 2016, which addresses off chain smart contract execution or the integration with legacy data or oracles. Learn more by exploring a deep dive of Project Bletchley - The Cryptlet Fabric, inclusive of a pictorial comparison to oracles. The second project is the Confidential Consortium Blockchain Framework, which addresses the needs of enterprise consortium networks for scalability, flexible confidentiality and improved governance. Ledgers integrated with the framework allow competing companies to participate on the same blockchain and ensures confidentiality of their transactions among parties they’d like to include. Other projects, such as the Enterprise Ethereum Alliance’s fork of Quorum do this in different ways. Confidential Consortium Blockchain Framework does this using secure enclaves or trusted execution environments delivered either at the chip level, using Intel SGX, or in software using Windows Virtual Secure Mode. We announced this project August 10th, 2017 along with partners Intel, Mojix, and JP Morgan’s Amber Baldet, representing Quorum. 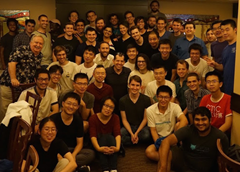 Some of our team members were lucky enough to attend the July 2017 IC3-Ethereum Crypto Boot Camp at Gates Hall, Cornell University along with other industry collaborators. Wind the clock forward, and we have joined the IC3 team just as they move into their new offices on Roosevelt Island for the Fall Semester at Cornell Tech. We continue to be excited about the work the IC3 team is doing and look forward to collaborating more closely and their upcoming events such as the October 2017 retreat and Blockchain Workshop. 우리가 어디로 가고 있는지 알아보세요. Azure 제품의 예정된 변경 내용을 확인해 보세요. Azure에 대한 의견과 향후 바라는 점을 알려주세요.